Creates a new object based on a set of user-defined inputs. 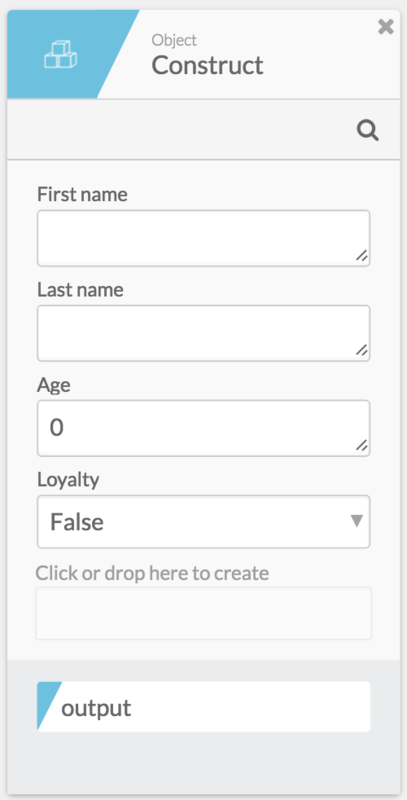 (user created fields): Create one input for each key you want to create in the output object. The input names become the key names in the object that gets created. Each input can be set to any type, including object or list. You can build any object using this function. You can set the inputs to any type, including lists. As an advanced usage, if you want to define one of the keys as an object and you also want to construct that object at runtime, you can use two object.constructs - define the inner object first, then define the second object, setting one of the keys to type object. Finally, drag the output of the first card into the object key in the second card.